At only 16, Bea Miller is already taking the music world by storm. She’s opened for Demi Lovato and Fifth Harmony and her “Young Blood” music video has over 6 million views on YouTube. 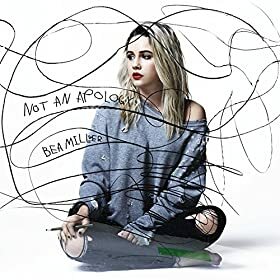 Miller’s debut album, Not An Apology opens with her two officially released singles, “Young Blood” and “Fire N Gold.” Both are strong, powerful songs, the latter being the better of the two. It showcases the smoky vocals of her lower register while displaying her letting loose and belting out the chorus. “I Dare You” and “Paper Doll” are both anthems of strength, talking about breaking down walls and standing up to others about being who she wants to be. “Perfect Picture,” “Enemy Fire,” and “Force of Nature” then shift the topic to love, the latter bringing the upbeat tempo of the rest of the album down to a gorgeous ballad. The last part of the album falls a little bit short of the high bar set by the rest of it. While “This is Not an Apology” is a catchy enough song, the chorus seems overly polished, taking away the awesome raw quality Miller has to her voice. The lyrics to “Dracula” and last track “Rich Kids” take a turn from the rather mature lyrical content of the rest of the album. She’s a teen catering to other teens, but the lyrics on these feel trivial compared to the rest. Miller has an astonishing amount of talent for such a young artist and the hype around her is completely deserved. She has the voice of someone much older and more experienced. This album is a perfect start for her career, with much of it being outstanding. There are a few missteps, but for a debut album this is beyond impressive.